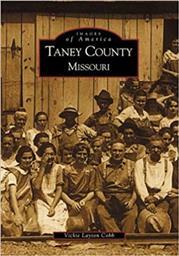 TANEY COUNTY MISSOURI - IMAGES OF AMERICA BOOK. 128 pages. Taney County Missouri obtained its name from Roger B. Taney who married Anne Key sister of the author of America's national anthem Francis Scott Key. With roots already embedded in Americana this once fledgling area in southwestern Missouri would become home to hearty pioneers and entrepunearal miners who would over the centuries transform it into the major tourist region it is today. Captured here in almost 200 vintage photographs are the lives and spirits of those souls who founded Taney County and fostered its growth throughout the years. These images span two centuries to include the pioneers and early farming families of the 19th century as well as the hometown heroes of the World Wars. Pictured here are the one-room school houses early photos of life on the Buffalo and White Rivers the miners of the Turkey Creek Mining Company and various events and residents of Kirbyville Oak Grove Mildred and Branson also known as the Nashville of the Ozarks.